One of the early pioneers of both the environmental art movement and Conceptual art, Agnes Denes brings her wide ranging interests in the physical and social sciences, mathematics, philosophy, linguistics, poetry and music to her delicate drawings, books and monumental artworks. In 1982, she carried out what has become one of the best-known environmental art projects when she planted a two-acre field of wheat in a vacant lot in downtown Manhattan. Titled, Wheatfield — A Confrontation, the artwork yielded 1,000 lbs. 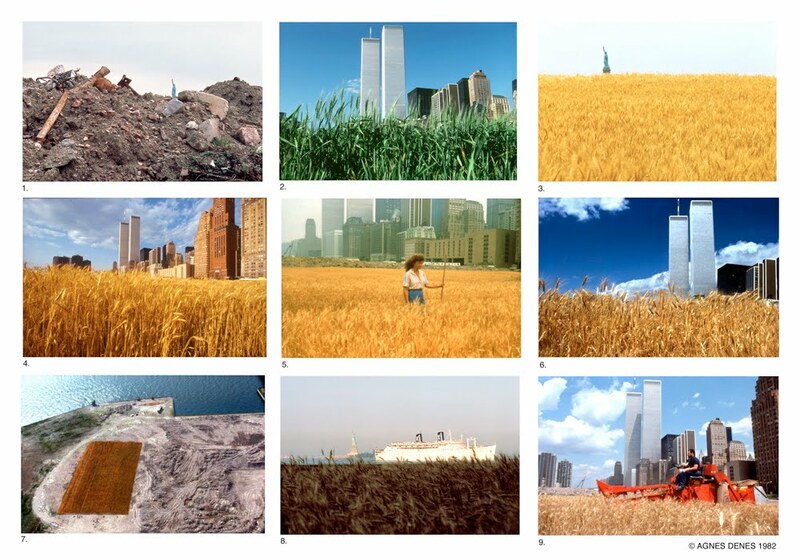 of wheat in the middle of New York City to comment on “human values and misplaced priorities”. The harvested grain then traveled to 28 cities worldwide in “The International Art Show for the End of World Hunger” and was symbolically planted around the globe. In 1996 Denes completed “Tree Mountain — A Living Time Capsule” in Finland. 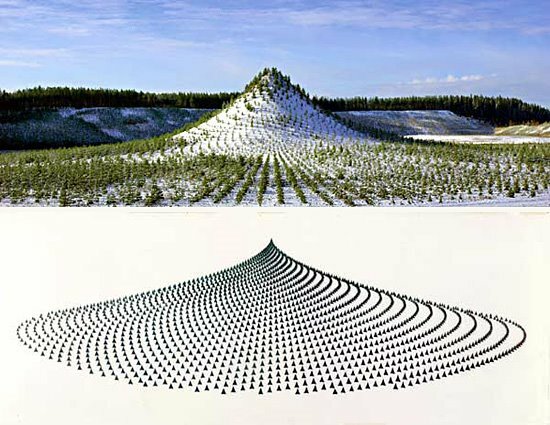 This massive earthwork and reclamation project involved the construction of a “mountain” on the site of an old gravel quarry and the planting, by volunteers from different countries, of 11,000 Finnish Pine trees in an intricate pattern. The volunteers were then each given inheritable certificates (valid for 400 years) which granted them responsibility for the stewardship of one of the trees. This project was first announced by the Government of Finland at the World Summit in Rio de Janeiro as a contribution to global ecology. Other projects have included reforestation of endangered tree species in Australia in 1998, planting crops in downtown Caracas, Venezuela as well as exhibitions of mathematically inspired drawings, book projects and installations in major museums worldwide. In a prolific career spanning the history of the environmental art movement, Agnes Denes has consistently pushed the boundaries of ecologically inspired art. She has created works of stunning beauty linked not only to the cycles of life but to notions of human stewardship and responsibility.